Elmer “Jerry” Griffin, 79, of Cherry Log, GA, formerly of Plant City, passed away Saturday morning, Jan. 12, 2019, at his home. Jerry had lived in Georgia for the past 18 years and attended Temple Baptist Church. He was a U.S. Air Force Vietnam veteran and enjoyed hunting, fishing and drag strip racing. Survivors include his wife of 19 years, Eileen McLin Griffin, two daughters, four sons, 13 grandchildren and seven great- grandchildren. Graveside memorial services are scheduled for Saturday, Feb. 9, 2019, 2:00 p.m. in Memorial Park Cemetery in Plant City. Rev. Jim Conner officiating. Timothy Lynn “Tim” Ragan, 61, of Plant City, born in Plant City on March 27, 1957, entered into eternal rest on Jan.19, 2019. 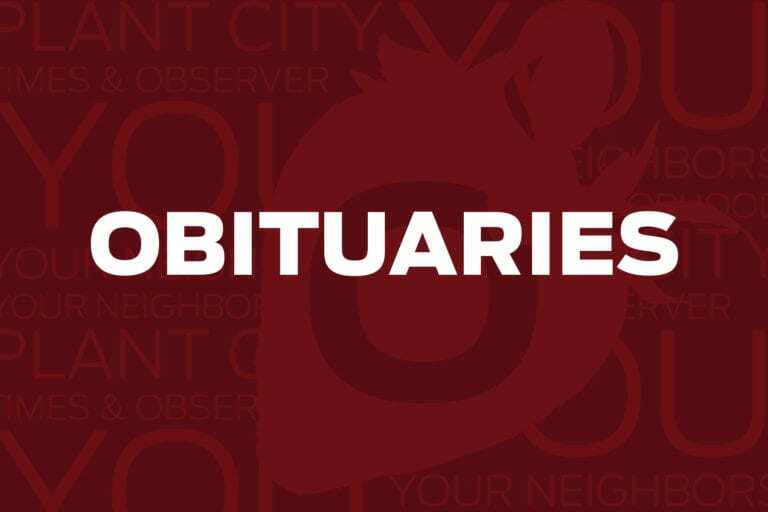 Henry K. Umble, 85, of Plant City, passed away on Jan. 31, 2019. Services will be held at a later date in Philadelphia. Jean Frances Weaver, 91, of Plant City, born in Lakeland on May 25, 1927, entered into eternal rest on Feb. 1, 2019. Richard “Rich” Magoon, 79, of Plant City, passed away on Jan.31, 2019. Richard retired from the U.S. Air Force after 21 years. Cohen Michael “Mike” Mosley, 67, of Dade City, died Thursday, Jan. 31, 2019, surrounded by his loving family in Plant City. Graveside service was held on Wednesday, Feb. 6, 2019 at 11 a.m. at Floral Memory Gardens in Dade City. He leaves behind many friends and loved ones who will dearly miss him.